The façade of Melbourne Town Hall is an interesting study of numerous architectural branches: a fascinating combination of marvelous Corinthians pillars with intricate motif engraved at the capitals, beautifully symmetrical Tasmanian freestone’s body seated above the darker foundation of bluestone plinth, paired windows with repetitive design separated by brown mullions, round Roman arches, a clock tower with sloping mansard roof, and a French-style balustrade at the balcony. The Town Hall was designed by Joseph Reed and Barnes in the French Renaissance style, with Reed being the same architect that created the State Library of Victoria, Royal Exhibition Building and the Melbourne Trades Hall. The Melbourne Town Hall was built in an era where the sight of carcasses scattering at the front steps of premises, and unbearable stench of rubbish discharges permeating the main streets were day-to-day common occurrences. The sanitary condition was awful, underground sewerage was non-existent, and clean supply of water was a rarity. Yet despite the imperative issues of contagious epidemic and appalling hygienic situation, Melbournians of the higher hierarchy were engrossed with fancy dress balls and frivolous entertainments, thoroughly enjoying the limelight of publicity and media. The opening night of the Melbourne Town Hall in 1870 was celebrated with a grand concert, followed by a night of lavish formal ball for the aristocracy where large quantities of fine delicacies and over hundred crates of best French champagne were served. All expenses were personally funded by the very popular Lord Mayor at that time, Samuel Amess. 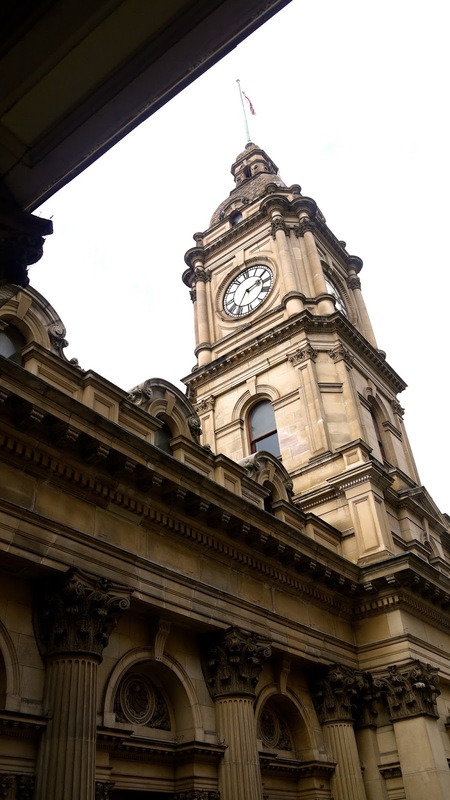 For the next few decades, Melbourne Town Hall was embroiled in a series of controversial administrative decisions tainted with discrimination and social prejudice. The so-called “people’s hall” had on numerous occasions rejected the applications of its unfavourable organizations to use the Town Hall: the anti-consriptionists, the socialists, the communists, and the Irish Catholics were some of those groups that were included in the Town Hall’s invisible blacklist. Today, the Melbourne Town Hall is a popular venue for people to gather for a wide range of activities, festivals and celebrations. It was the place where Beatles greeted its massive congregation of fans from the balcony in the 1960s. It is a favourite location where public can enjoy various theatrical performances and comedy shows, where weddings are held and banquets are served, where numerous musical concerts are conducted frequently in its impressive auditorium. The exterior of the Town Hall would be dressed up extravagantly in awesome Christmas lights and moving animations, in accompaniment of delightful music performances during the festive season in December. It is also a popular spot for the public to observe extraordinary artworks and amazing nightlights on special occasion such as the White Night Melbourne in February. Today, the Town Hall is the perfect venue for entertainments and all things fun. Any controversy of its past is, perhaps, history best to be forgotten. Free tour is available on weekdays. See here for more information.